Watch video on how to make sure your installation works with CCS Max. CCS Max is compatible with Firefox v56 and Greasemonkey v3.10†. NOT COMPATIBLE WITH FIREFOX v57! We're looking into making it compatible but will take a few weeks if not more. In the meantime, CCS Max for Google Chrome is a good alternative - just added a new feature for FA RESV POOL page. Please do NOT download & install more recent versions without first checking with this page. Disable Firefox auto update! PC: FF menu Tools >> Options and then Advanced >> Update tab - uncheck Automatic updates. Mac: FF menu Preferences and then Advanced >> Update tab - uncheck Automatic updates. Maximize your CCS experience using the CCS Max software-extension along with Firefox browser. Trip Alerts  Receive SMS text messages on your cell-phone when desirable trips appear in open time. More info. Star Pairing Ratings  you can rate pairings by specifying your own criteria. For example, preferred destinations, crew-members etc. More ratings info here. Pairing Pay Calculator  more info. Optimal Reserve-Pool page display  optimally displays the info for quickly figuring out the coverage. Master-Schedule page  view pairing-info directly from master-schedule page. Export Schedule to external Calendar  more info. Crew Photos  view crew photos of those on your flight schedule. Also printable. Messaging  Send and receive messages from any CCS user who also has CCS Max installed. Many other features  making CCS Max a truly indispensible tool for the crew-member who wants to take CCS to the max! If you're upgrading from an earlier release of CCS Max, make sure you have the required version of Greasemonkey extension (STEP 3). Then skip to STEP 5. STEP 1: Download Firefox browser. It's a better alternative to the other one  faster, safer and highly customizable. STEP 2: Install Firefox and then revisit this page using Firefox browser. STEP 3: Install Greasemonkey software extension  click here to download & install Greasemonkey v3.10 (check installed version). Firefox will warn you that an extension is being installed and display a button labelled Edit Options on the top-right. Click on it and enable downloads from this site. Click on the Greasemonkey install link above again and this time it'll be installed. After restarting, you should see a small monkey-icon on the top-right corner of the browser. STEP 5: Install CCS Max - click on the link below. fixed: RESV POOL works again. IMPORTANT - once the table is displyed, press ENTER button two times. Tip: When you click on the link, if you get a page full of squiggly code  make sure Greasemonkey is enabled. Tip: When you click on the link, if you get a blank page then select the Tools»Options menu and click on the Security tab. Click on the Exceptions button and enable downloads from ccsmax.com site. On clicking the link above, Firefox will display a warning along with an Install button. Click on the button to install CCS Max. STEP 6: Log into CCS and enjoy! You know everything is working ok when you see the enabled monkey-icon ( ) and the CCS Max message at the bottom of the CCS home-page. Once you have it running (i.e. see the monkey-icon on the browser), it should work transparently. If you'd like to turn off CCS Max for a while, click on the monkey-icon to disable it ( ). Click again to re-enable it. Can CCS Max be installed in Internet Explorer? No...but there's a version for Google Chrome also. Yes..Mac version of Firefox should work fine. Will CCS Max work on my iPad or other tablet? No. CCS Max requires the desktop version of the browser. But we do have a mobile app - CCS Mobile. When I click on CCS Max download link, I see a bunch of squiggly code? Make sure Greasemonkey is enabled. Click on the arrow next to the monkey icon and make sure 'Enabled' is checked. Got everything installed properly - still not working. Now what? When using CCS Max for the first time, you'll be in trial mode. All features are enabled for 30 days. On expiration, many features will be disabled. Enough features will be left enabled to make it still a useful tool and you can use it as freeware indefinitely. Users will have to subscribe to re-activate the features. What features are disabled once trial period expires? When you pay by Paypal to become a CCS Max member, you're in PREMIUM mode. It's indicated by a star on the CCS Max logo when you login. All disabled features are re-activated for a period depending on the membership amount. 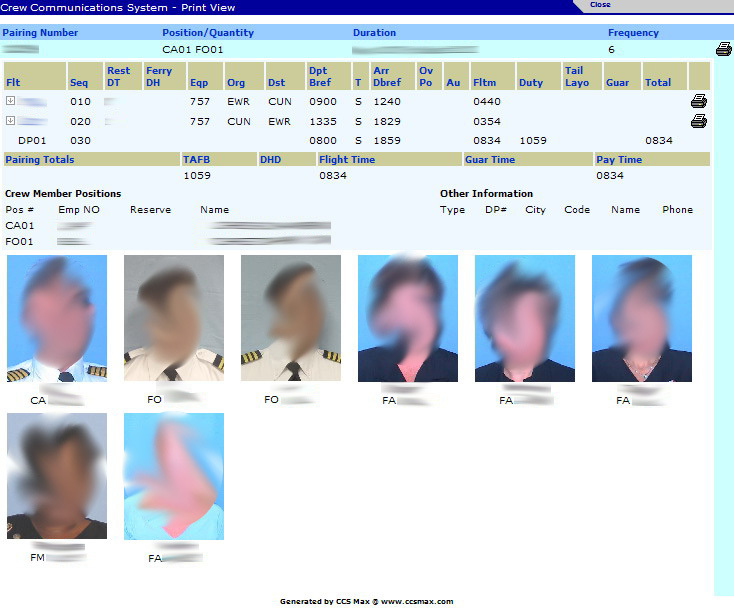 Plus, you also get Open-Time crew photos and fully enabled Trip Alerts. Minimum is $7. Beyond that, you can pay whatever amount you wish - depending on how much value you think this tool brings to your everyday CCS experience. Premium features will be enabled for a duration directly proportional to the amount paid. Rate is $0.23/day (e.g. $7 enables features for 30 days) or at a discounted rate of $60/year. Membership is not automatically renewed. You have to log into CCS. On the CCS home page you'll see PayPal and Google Wallet links. There's also a pay-by-check option for additional discounts. I don't see this Paypal link on the CCS home page? Make sure you have Greasemonkey and CCS Max installed properly. Please go through the install steps above and confirm you have the required versions. No refunds after 30 days. The amount for the period already used will be computed at daily rates and then refunded to your Paypal account. CCS Max does not remember passwords correctly - help? You need to disable Firefox's password remember feature. Go to Tools»Options menu and click on the Security tab. Then click on the Saved Passwords button. From the displayed list, remove the password for ccs.coair.com (ccs.xjt.com for Express) site. Also, later after entering your password(s) and when Firefox prompts whether to remember them or not  select Never. I can't seem to get the CCSMax rating settings to work on the open time page. CCS Single-Page option has to be de-selected. Otherwise ratings will only be displayed once you select a pairing and CCS takes you to a new page. On the open time page, what do purple lines mean? Means you're viewing that pairing for the first time. My settings (e.g. fields, viewed pairings) are not saved. Everytime I login I have to re-enter them? When done with CCS, click on the CCS Logoff link. Your settings are then saved online. How do I print My Schedule with crew photos? On My Schedule page, click on the printer icon on the right side of the pairing row. How do I import my schedule into my Outlook calendar? In Firefox, select Tools»Add-ons menu option. A window will be displayed. Select Greasemonkey from the list and the click on Uninstall button. Restart Firefox.